Two SEAFDEC staff participated in “The 11th Regional Plan of Action to Promote Responsible Fishing Practices including Combating IUU Fishing in the Region (RPOA-IUU) Coordination Committee Meeting” from 13 to 15 November 2018 in Yogyakarta, Indonesia. The Meeting was attended by nine (9) RPOA-IUU participating countries (namely: Australia, Brunei Darussalam, Indonesia, Malaysia, Papua New Guinea, Singapore, Thailand, Timor Leste, and Vietnam). 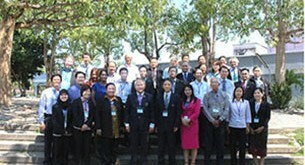 The Southeast Asian Fisheries Development Center (SEAFDEC) attended the meeting as an Advisory Body to the RPOA-IUU. Moreover, the representative from SEAFDEC presented “The progress of SEAFDEC initiatives toward the support on implementation of the RPOA-IUU in the Southeast Asian Region.”. The Meeting came up with updated progress on implementation of work plan 2018 and development of work plan for 2019 including IUU-related issues at the regional and international level.